According to previous calculations by astronomers, one in every thousand massive galaxies is a relic of the early universe. It’s an almost esoteric term that describes a galaxy whose properties are still largely the same as when it formed billions of years ago. Now, scientists say they’ve finally identified one for the first time. Researchers at the Instituto de Astrofísica de Canarias (IAC) and the University of La Laguna (ULL) used ground-based telescopes to study NGC 1277, a galaxy located 225 million light-years away, in the heart of the Perseus Cluster — the largest concentration of galaxies close to the Milky Way. Their initial observations suggested something odd about the globular clusters surrounding NGC 1277. Globular clusters are spherical collections of ancient stars, formed at the same time as the galaxy, that orbit the galactic core as a satellite. Scientists class globular clusters in two distinct groups: red globular clusters, which are formed in massive galaxies nearer to their centers, and blue ones, which are found more toward the outskirts of the galaxy. Red globular clusters have a higher concentration of heavier elements (hence the color), while blue ones have a lower fraction of metals. When the researchers pointed the Hubble Space Telescope towards the globular clusters surrounding NGC 1277, they struck gold. The observation revealed that the galaxy only has only red globular clusters, which have remained unchanged since they were formed many millions of years ago along with the galaxy. NGC 1277 is composed of a thousand billion stars, and its relatively close proximity to Earth provided an excellent opportunity to find a rare wonder of the cosmos. “The galaxy NGC 1277 gives us a unique opportunity to study a “primitive” galaxy in the “local” universe” adds Ignacio Trujillo, another of the article’s authors. According to the researchers, when the galaxy formed, it used to birth stars at a rate of 1,000 per year, whilst the Milky Way is currently forming only one star per year. The team believes that the reason why the galaxy has remained unchanged during all this time, retaining its original form and composition, is because it formed as a satellite to the central galaxy of the Perseus cluster. Since the cluster absorbed most of the material that could have fallen into NGC 1277, this dynamic has caused the relic galaxy to evolve differently. “We argue that the colour distribution of the cluster system of NGC 1277 indicates that the galaxy has undergone little (if any) mass accretion after its initial collapse, and use simulations of possible merger histories to show that the stellar mass due to accretion is probably at most ten percent of the total stellar mass of the galaxy. 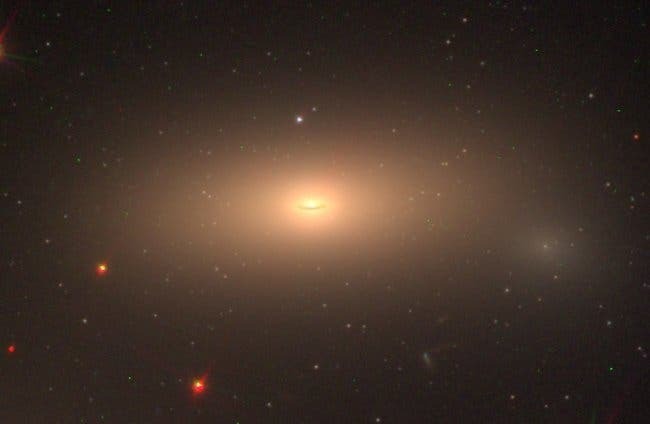 These results confirm that NGC 1277 is a genuine relic galaxy and demonstrate that blue clusters constitute an accreted population in present-day massive galaxies,” the authors wrote in the journal Nature. The authors hope to find more relic galaxies in the future using the Hubble Space Telescope and its successor, the James Webb Space Telescope.